A simple laser beam could disrupt aliens’ observations of Earth, making it look like there’s nobody home on the third rock from the sun, a new study suggests. David Kipping, an astronomer at Columbia University in New York, said he first considered this idea when he heard about the strangely dimming star that was detected recently by NASA’s Kepler space telescope. Researchers speculated the signal could have come from an “alien megastructure” orbiting the star. That’s a remote possibility, many scientists stressed; the star’s strange signal likely has a natural cause. But the Kepler observations got Kipping thinking about ways humanity could alter the signals it sends into space — or hide them altogether from life-hunting aliens, who may have malicious intentions. He and Columbia graduate student Alex Teachey concluded that it would be surprisingly easy to wipe out Earth’s signal, distort it to look strange or even edit out the fingerprint of life — provided researchers knew the location of the snooping aliens. “We essentially played the thought experiment that if we really had xenophobic tendencies and wanted to avoid the Earth being discovered (as Stephen Hawking and others have been warning about), could we hide the Earth from alien planet-hunters?” Kipping said in an email. The key to Kipping and Teachey’s thinking lies in the way humans have identified most planets around other stars, a process called the transit method. This strategy, which has most famously been employed by the Kepler spacecraft, detects tiny dips in the brightness of stars, which can indicate an orbiting planet. The transit method could theoretically be used by alien civilizations to detect Earth, too. But there’s a way to trip up such extraterrestrial searches, Kipping and Teachey said. “To make it look like the planet is not there at all, you’ve got to get rid of that dip. You’ve got to fill in the missing starlight,” Teachey said in an explanatory video. NASA’s Kepler space telescope uses small dips in a star’s brightness to detect planets passing in front of the star. Each planet will leave a distinctive light signature. 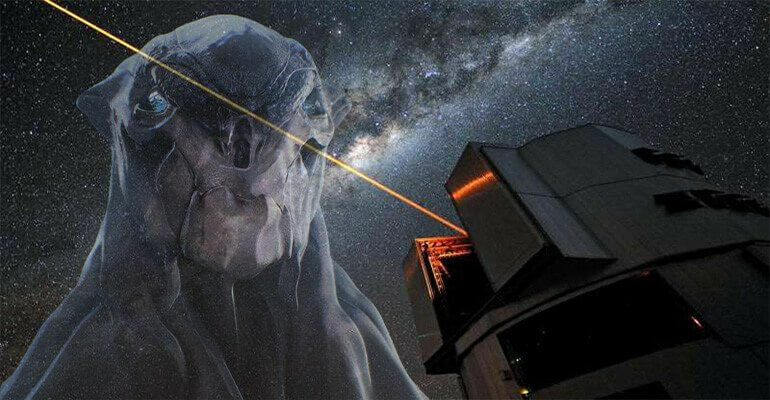 Engineers could shine a very bright laser or collection of lasers toward a star suspected of hosting intelligent aliens during the time Earth was passing in front of the sun from the other planet’s perspective. Then, aliens making measurements wouldn’t see any change in solar brightness. “We could build this next week if we wanted to,” Teachey added. To alter Earth’s signature as seen by an alien version of Kepler, a laser system would have to emit 30 megawatts of power for about 10 hours per year, coinciding with Earth’s passing in front of the sun, the duo calculated. That equates to significantly less than the energy the International Space Station gathers in a year with its solar panels, Kipping said, or the energy used by about 70 homes over the course of a year. Such a laser system, either on Earth or in orbit, could charge its solar-powered batteries for most of the year and then release the high-powered blasts at just the right time, brightening when the sun’s light would normally dim. While a laser of that intensity hasn’t been built before, the researchers said, such a cloaking system could also use multiple smaller lasers, all shining in the same direction. The alien star would be so distant that such a difference would be indistinguishable. Laser beams are tightly focused, but at greater distances, the beams will have grown large enough to require less precise aim. Shining a laser beam toward a planet whose inhabitants might see the Earth pass in front of the sun could replace the light the Earth blocks out. This would conceivably hide the planet. Using different laser wavelengths can create other illusions with the Earth’s transit. By varying the wavelength and strength of the beams, humans could conceal Earth from more complicated detectors. Such a “cloak” that concealed all wavelengths would take about 250 megawatts of power, with lasers blasting at different wavelengths, the researchers said. The laser strategy could also alter Earth’s signature to look like almost anything, even something that appears distinctive and artificial, the scientists said, like the New York skyline or a featureless box. While a planet that was fully cloaked could still be detected by other means, such as by the gravitational pull it exerts on its star, this kind of cloak would arouse less suspicion, because the planet would be there as expected, just without signs of life. Kipping and Teachey laid out their thinking in a study published Thursday (March 31) in the journal Monthly Notices of the Royal Astronomical Society. Concealing Earth’s existence from extraterrestrials, or announcing its presence with an artificial light curve, would work only if humanity knew or suspected where those aliens were living. But the concept is still intriguing as scientists look out to read other stars’ light signatures and speculate about alien astronomers reading signals from Earth. Kipping and Teachey suggested that alien civilizations could communicate with each other during transits by varying their light signatures, because individuals investigating a planet are likely to watch it as it passes in front of its star. Alien lasers could even encode information to transmit, the researchers said. One possible next step, they added, would be to look more carefully through archival Kepler data to search for artificial signatures. Jason Wright, an astronomer from Pennsylvania State University, recently published a paper about how scientists could identify advanced civilizations around other stars. “Alien megastructures” would dim stars more than expected, whereas lasers would tend to brighten them, but “we should look for both,” Wright told Space.com. In terms of this particular technology on Earth, “The only time it’d be useful for us is if we had some knowledge of alien civilizations along the thin strip of the sky that would see Earth transit the sun,” he said. Energy demands would quickly grow as a civilization tried to hide from, or signal to, an increasing number of star systems, Loeb added. But the laser cloak is still an interesting new idea to add to the arsenal in the search for extraterrestrial life, he said.